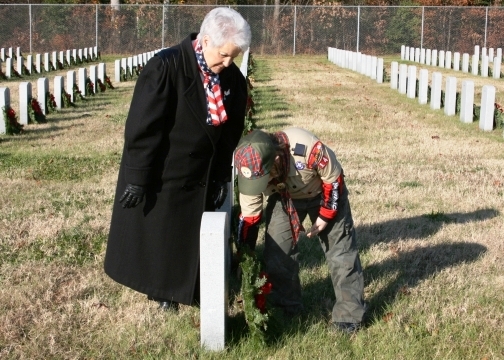 Last month on 15 December 2012, Wreaths Across America (WAA) sponsored and coordinated the placement of 420,000 remembrance wreaths by almost 200,000 volunteers on the headstones of our nation’s fallen military in 825 locations in America and abroad. 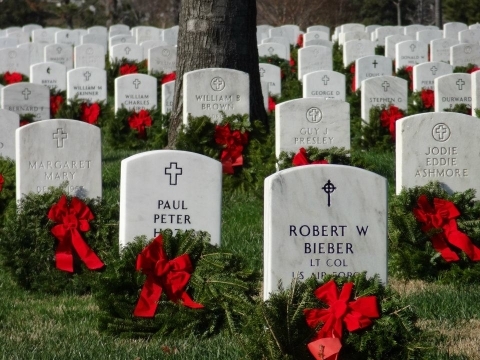 At Arlington National Cemetery in Virginia, more than 20,000 volunteers laid 110,662 wreaths. This was the 21st annual wreath-laying event. In 1992 in Harrington, Maine, as the Christmas holiday season drew to a close, the Worcester Wreath Company found itself with a surplus of fresh, evergreen wreaths. The owner, Morrill Worcester, made arrangements to have the wreaths placed in one of Arlington cemetery’s older sections where fewer visitors were coming each year. A local trucking company transported the wreaths to Virginia, and American Legion, VFW, and other volunteers decorated each wreath with the traditional, hand-tied red bows and laid them on the headstones. There was also a special ceremony at the Tomb of the Unknown Soldier. 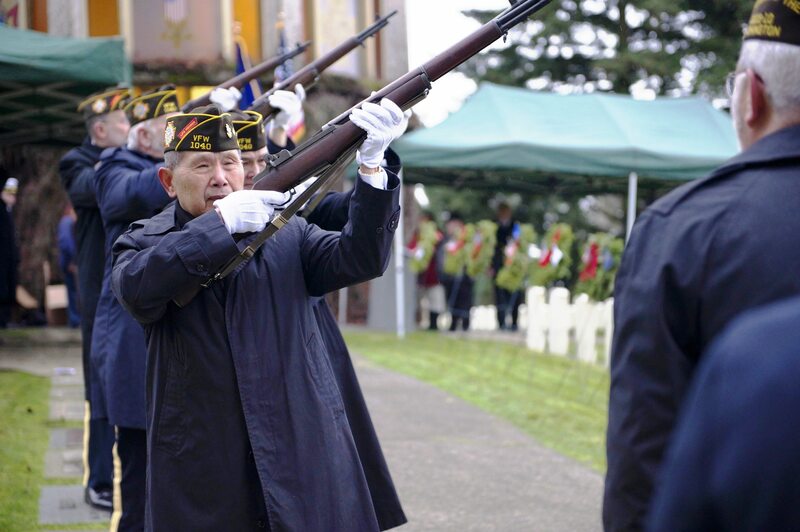 VFW Post 1040 Honor Guard, WAA ceremony, Veterans Memorial Cemetery, Evergreen-Washelli, Seattle, 12-15-’12. Photo by Nathan W. Bradshaw, PA3, USCG. In the state of Washington, 18 cemeteries are affiliated with WAA. The four largest are the Tahoma National Cemetery in Kent (23,000+ graves; 15,500 veteran graves and 13,000 veteran columbarium niches); Evergreen-Washelli-Veterans Memorial Cemetery in north Seattle (5,000+ veteran graves); Mountain View Cemetery in Walla Walla (37,000 graves; 2,500 veteran graves); and Washington State Veterans Cemetery in Medical Lake (550 veteran graves). 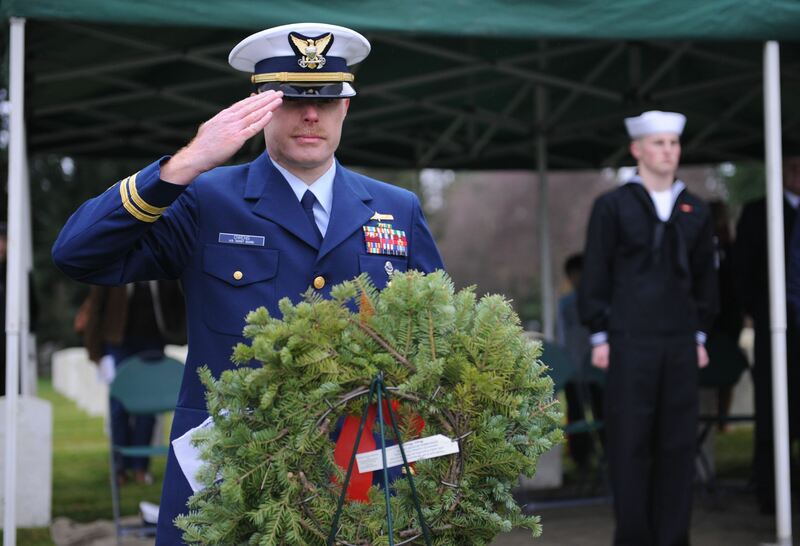 At Veterans Memorial Cemetery at Washelli, this was the 3rd annual wreath laying ceremony sponsored by the Navy Wives Club #277. King5-TV again covered the event in a superb report. Please see http://www.king5.com/video/yahoo-video/200-wreaths-cemetery-183725091.html. You’ll see the VFW Post 1040 Honor Guard fire three perfect rifle volleys, hear the post piper play some of “Amazing Grace,” and hear me play “Taps” in the background as the reporter tells the story. For a description of the previous year’s event, please see my post of 16 December 2011. Glenn Ledbetter, VFW Post 1040 Bugler, sounds “Taps.” Photo by Nathan Bradshaw, PA3, USCG. Washington State Veterans Cemetery, Medical Lake, WA. Photo courtesy of WAA. National Memorial Cemetery of the Pacific (aka “Punchbowl”), Honolulu, HI. Photo courtesy of WAA. Valley Forge, PA. Photo courtesy of WAA. This entry was posted on January 9, 2013 at 8:11 pm	and is filed under Ceremonies & Celebrations. Tagged: Amazing Grace, Arlington National Cemetery, Evergreen Washelli, Navy Wives Club #277, piper, Taps, Veterans Memorial Cemetery, VFW Post 1040, Worcester Wreath Company, Wreaths Across America. You can follow any responses to this entry through the RSS 2.0 feed. You can leave a response, or trackback from your own site.